I had just ask my client to embark on a bit of an experimental adventure in her upcoming carrier choices and invited her to do a blind constellation with me. I wrote on a piece of paper her different options, I put out a chair for each one of them for her to take a seat upon without telling her which chair represented which option. The goal was for her to move beyond her thinking wisdom into her feeling wisdom. Willingly she took up the challenge. The outcome was more than she had bargained for. She could describe her feelings on each chair so accurately that it gave her a completely new insight into what actually lived inside of her. And that this was so real as she had felt it, that she thought of this as valuable information. More valuable than the loop of thinking about her choices with a mind conditioned in certain beliefs. When I revealed the blinded options, of course the thinking mind came back and tried to understand. That’s just what they do, our beautiful minds. Most of the time they can’t understand though. Particularly when we are setting out to discovering ourselves anew. When we work on moving forward in life and develop and heal ourselves beyond our stories and beliefs about who we are or should be. So I had to respectfully ease my clients mind by reminding it about its righteous role; it could organise the steps to follow and make happen what her gut had told her. It’s companions in this role would be the Post-Its. The intervention I chose in this particular case and at this particular time in the cooperation between me and my client was systemic. I find that systemic work – in any situation – is such a powerful tool to gain access to more wisdom that is right there available to us, but not accessible by just thinking. I use it all the time – personally and professionally – that I confidently apply it to businesses as well as an effective way of exploring opportunities for progress. The time is so right for it now quantum physics has gained a place on the mainstream stage in science. The science that (is still in process of) quantifying the fact that underneath the physical manifestations of our 3d world, we avail of infinite possibilities; the quantum field or unified field. This is an invisible field of energy and information what, and here it comes, governs all the laws of nature. This is therefore the source from which change can spring. When my clients’ thinking mind questioned the wisdom available to us when we start working with a field of potentiality that moves from a greater intelligence than our human capacity of thinking, I explained to her that that any experience already exists as an energy or a frequency in the quantum field before an electron collapses into matter and thus into existence as we tend to perceive it in materialized sense. So if we open up to working with the quantum field we actually live in, we open up to more opportunities for moving forward. In this case I had helped my client to navigate the quantum field by super positioning her concrete new options and to experience which was in alignment with the greater intelligence that she could avail of. And this is just so extremely interesting about this time. As newtonian physics do not apply here we no longer have to limit our capacity by looking at reality in a fragmented, solely rational way and we can open up to so many more possibilities and even create new realities by aligning with a greater intelligence. I see this a my real work, being responsible, ‘clean’, modest, yet adventurous enough as a facilitator to explore this realm of reality with my clients. 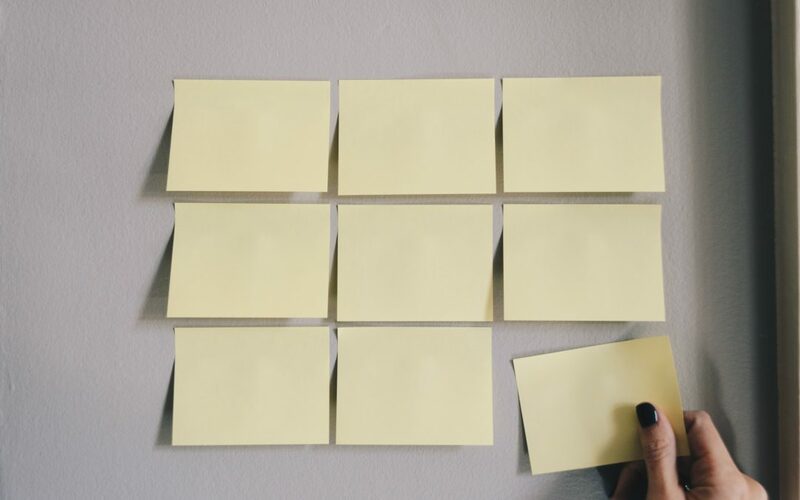 You see, a first step to exploring what is possible for you could lie in sticking a bunch of electrons collapsed into a couple of Post-Its holding our greatest perceivable dreams for yourself to the ground.